Newtown is like a cornucopia of beautiful homes in wonderful neighborhoods in this classic close-knit family town. Being Connecticut's largest town, there's lots of land and space to discover. Within the past 10 yrs or so many new properties have been built offering buyers everything they could want in a home at a good price. I have relocated many families to Newtown and they all say the same thing, "This is such a great community". The town center includes the well-known Flag Pole, such a pretty sight. Nice variety of terrific restaurants including Italian, Asian Fusion, American, Chinese, Grills, Thai, Indian, Breakfast restaurants and more. Make sure to visit the Butchers Best Market which offers fresh, local, natural foods. Starbucks, nail and hair salons, toy stores, diners, sandwhich shops, Ferris Acres Creamery (the most amazing ice cream made on premises) and more. If you're feeling energetic then it's time for golf (great public and private courses), play tennis or visit the skate park, or the Newtown Youth Academy which offers a great gym, snack bar, equipment and fitness programs for a minimal membership. Horse back riding enthusiasts feel right at home here with many bridle trails throughout Newtown and Sandy Hook. Many lucky homeowners can ride their horses from their backyard right onto a bridle trail system (which is maintained by volunteers). There are premier equestrian facilities and clubs here that add to the enjoyment of this idyllic New England town. Search smarter: Register to save your favorite properties as you search, and receive updates when similar listings hit the market. Contact Kim Gifford to start your real estate endeavor today! Take in the gorgeous sunsets from your large front porch which is the introduction to this wonderful classic colonial farmhouse in Bennett's Farm. Sophisticated 4 bedroom colonial surrounded by beautifully maintained gardens, mature plantings & lush lawns!. Your backyard features a heated Gunite pool, flagstone patios and cabana. Entertain your guests in your open format family room w/fireplace, vaulted ceiling & hardwood floors. Spacious eat-in kitchen, granite countertops, hardwood floors. Formal living room & dining room with hardwood floors. Office, Butler's Pantry, Powder room and spacious laundry room with sink completes the 1st floor. Upstairs enjoy your private master bedroom retreat with spacious bathroom, and huge walk-in closet. Three additional bedrooms and full bathroom complete the upstairs space. The lower level features additional living space for a game room, exercise room or play area. Security system, and entire home generator are added features to this spectacular home.This is a fabulous home ready for you to move in and enjoy! Solid 2 bedroom Ranch in very desirable Sandy Hook neighborhood. The home needs updating and TLC and is being sold "as-is" and subject to probate approval. It has newer heating system, oil tank and HW tank The roof and siding both appear to be newer and in very good condition. It offers hardwood floors, fireplace, a full unfinished basement, and is just waiting for your remodeling ideas to make this home shine again. It is set on a .50 acre lot with nice back yard, and storage shed. Call today, this wont last. Agent is related to owner. Looking for a Center Hall Colonial, located in the perfect New England setting, then you're gonna love this 4 Bedroom, 3 Bath home on over 2 Acres. You'll enjoy privacy but still be close to Restaurants, Shopping, Tennis, Swimming, Parks and more. The Family Room, with it's Brick Fireplace, sits adjacent to your Kitchen with Granite Counter Tops and Stainless Steel Appliances. Hardwood Floors throughout! Additional rooms include Great Room, perfect for entertaining, Sun Room, a place to relax and read a book! Convenient to I-84 making for an E-Z commute. This is a must see! Call today for a showing! Ever Dreamed of owning a home that has everything? Ever dreamed of paying half price for that home? Here's your chance!!! Over $2.2M invested in this masterpiece that has everything. Almost 11,000 finished square footage is found just within the home and that doesn't even include the detached 3 car carriage house that has a finished area above. Situated at the end of a private, premier, quiet cul de sac on 6.3 acres this home includes, a 500 bottle climate controlled wine cellar, 6 garages, 7 bathrooms, 6 bedrooms with the potential of an in law suite, a gunite pool with a separate hot tub and waterfall, koi pond, gazebo, 6' Refrigerator and Freezer combo, extensive trim, coffered ceilings, 2 fireplaces, a 3 tier home theatre, workout/yoga room, game room, built in wall aquarium, and so much more. Truly one of the nicest homes in Newtown. Schedule a showing today!! Welcome to 6 Kent Road located on a wonderful cul de sac very close to town truly the best of both worlds. You will be greeted by a brand new driveway entrance featuring lighting and a lined Belgium Block circular driveway. This beautiful home is filled with all the details you are looking for including arched openings, extensive trim work, hardwood floors throughout that have recently been refinished. The kitchen is simply spectacular and easy to love and live in. All new high end appliances, granite counters and a beautiful backsplash with tons of storage, a coffee bar and full walk in pantry. All this opens to the great room with a floor to ceiling stone fireplace that opens up to the extensive blue stone patio overlooking the pool area. You will enjoy an oversized dining room with fireplace and built in's. The master bedroom is on the main floor with a gas fireplace sitting area and luxurious master bathroom with three walk in closets. Since 2016 this home has had a full renovation that include fresh paint throughout, all new light fixtures and LED lighting, 2 new gas fireplaces, brand new master shower and custom closet in the master. Outside there is so much to enjoy a level yard with all new landscaping and new accent lighting around the pool, new pool heater, new whole house 22kw generator along with a brand new roof. Nothing left to do her then move in and enjoy life at 6 Kent Road. Sophistication and style is the name of the game! Gorgeous waterfront views in a quaint and quiet community on right on the river ! This home has beautiful hardwood flooring, ceiling fans and fireplace. A comfortable living room with sliders exiting right out onto a spacious deck with gorgeous waterfront views. This home features an open floor plan that is both functional and cozy making it perfect for any season. Custom-built Williamsburg reproduction home on the prestigious and highly sought after Taunton Hill Road. Perfectly sited on over 7+ acres. An extraordinary offer for discriminating tastes. This unique home features top of the line fixtures and mechanicals, a state-of-the-art gourmet kitchen, hand-hewn beams, rough sawn cedar paneling, 300 year old reclaimed brick, refinished oak floors, two fireplaces, a wood burning stove, a sunroom, a finished basement and a professional working office. Rare, old-world craftsmanship not found in typical offerings. This is not your everyday high square footage production home McMansion on a two acre subdivision parcel. Four generous sized bedrooms including a beautiful master suite. The finished basement offers additional storage and utility space. The backyard includes an oversized bluestone patio - the perfect site for a pool and any outdoor activity. Also included is a detached garage / workshop complete with electricity. A Generac generator provides backup power. This perfect property backs up to Holcomb Hill, a protected land trust. 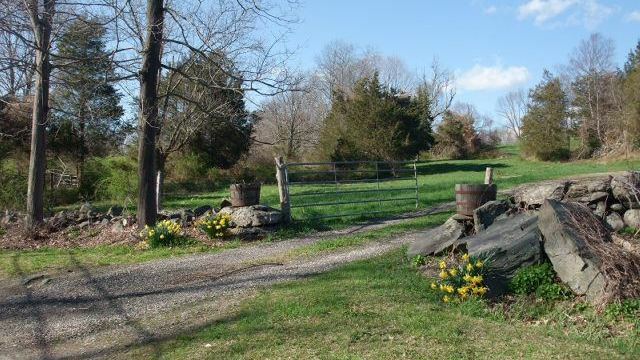 This lovely estate could also double as a horse property or family compound. There is plenty of room to add a separate guest cottage, car garage or barn. Come and see what sets the home apart from the rest! Just 5 minutes to the center of Newtown, shopping, and exits 8 and 9 of I-84. This location combines privacy and the best commutability in town - with lighting fast access to retail and major highways. Newtown-New Construction-Impressive 2,300 square foot 7 room, 3 or 4 bedroom, 3 full bath Contemporary Raised Ranch style home situated on a nice .92 acre level lot (room for a pool) in the Shady Rest Community with access to private beach and boat ramp on Lake Zoar. Features include an open floor plan with 12' ceilings in the kitchen, dining & living room areas, main level with 3" select hardwood flooring , shaker style cabinetry & Maytag Stainless Steel Appliances with 10 year warranty, gas fireplace with remote control, recessed lighting, 9' ceilings on both levels, master bedroom w/11' high vaulted trey ceiling, large walkin closet w/builtins & tiled bath, slider to 12'x14' deck overlooking the private back yard, generous size bedrooms with large closets, main bath with tiled floor and fiberglass tub and shower, pulldown stairs for attic access and storage, large lower level family room with full bath that can be modified for a 4th bedroom and slider to rear yard, 4 bedroom septic system in place, oversize garage with workshop area, laundry room, 2x6 and steel beam construction, Andersen windows & sliding glass doors , propane warm air heating & tankless hot water system, central air conditioning and more!. Property taxes upon completion are estimated at $7,800 per year. A must see home available for Spring 2019 occupancy! Totally renovated Raised Ranch in a convenient, central location close to everything! New kitchen with white Shaker cabinets, granite counters, a center island, stainless steel appliances, new hardwood floor and recessed lighting. Open, light, bright living/dining space with sliders to deck. All new baths with tile, marble top vanities, quality fixtures & matching accessories. Newly refinished hardwood floors on entire main level, new trim & six panel doors throughout, new upgraded lighting fixtures & door hardware. Freshly painted with designer colors. Remodeled lower family room with a fireplace. New town approved septic system. Well re-drilled to 500' with new well pump & equipment added. Exterior completely redone with new roof, vinyl siding, gutters, thermo-pane windows, entry doors, front porch & garage doors. Rebuilt 16' x 16" deck overlooks the private, level rear yard. New Hydro-air heating system with newer upgraded boiler & components, new central air conditioning and new electrical panel, plugs & switches. New landscaping, lawn areas & bluestone walks. Driveway re-graded and widened, with new base layer and gravel surface. Extremely convenient location is close to schools, parks, shopping, services, major commuting routes & town facilities. Feels like you are living in the country, but only minutes from the "Flag Pole" & the heart of Newtown. Almost new, with nothing to do but move in & enjoy! Remarkably Restored 19th century Colonial Farmhouse in the heart of Newtown, with all the historic charm of the era. The well-designed floorplan features main level LR, DR, EIK & office with original working fireplace & rich wide board oak floors. Upper level 3 beds, 2 baths, & finished attic. Restored original doors & hardware, with efficiency of new energy efficient windows & French doors, vintage style front door, this home is the ideal blend of old & new. Built circa 1830, this vintage colonial is fully updated, and ready to move in. Gorgeous hardwood floors throughout, granite countertops, stainless steel appliances, updated baths, new heating system, updated 200-amp electric, new roof; freshly painted inside & out. Public Water & Sewer! Level backyard with large barn, spacious back deck and patio. Spacious barn & loft leave some room for imagination. Game room? Artist Studio? Car Collection? So many possibilities. Your own Piece of Newtown History! Relax on the front porch, or back deck, just a short walk to the center of town, with some of the best Newtown has to offer. Minutes from 84, the convenience and charm of this property is incredible. Experience it for yourself with the virtual tour! Motivated sellers! Such a well built home like 4 Plumtrees rd in Newtown does not come to market to often. Painstakingly taken care of by one owner for nearly 28 years the home is now ready for a new steward. This stately 4 bedroom 2.5 baths colonial is perfectly situated in the "Taunton" side of town and upon a level 2+ acre parcel near two towns and several major commuting arteries. Upon entry, one's eye is drawn to the gorgeous marble entry that is flooded with natural light. The well thought out custom floor plan allows for wonderful site-lines throughout the home, creating a wonderful space for entertaining family and friends. The bright white kitchen boasts granite counters, lots of cabinets space, center island and lovely flow to entertaining spaces. Upstairs we find a spacious master suite with large walk-in closet and luxurious master bathroom with large tiled shower. Three other well sized bedrooms share another well appointed full hall bathroom. The the expansive rear deck overlooks a well manicured and private backyard. Don't miss this one! Classic Connecticut charm abounds throughout this 3 bedroom 2.5 bath Colonial perfectly situated within a desirable and established neighborhood offering privacy without seclusion. The open floorplan concepts allows for a wonderful entertaining opportunity with the well pointed kitchen flowing effortlessly to the family room with cozy fireplace and sliders to the expansive rear deck and backyard. Formal dining and living rooms complete the main level. Upstairs we find a grand master bedroom suite with walk-in closet, fresh master bath and loft space perfect for an office, nursery, exercise space or den. Two other generously sized bedrooms share another well appointed full bath to complete this level. Outside we find a lovely fenced yard perfect for many outdoor pursuits withing a private setting. The best of all worlds awaits you in this well cared for home.